From Sept. 6 through 9, about 3,000 people will descend on the high desert above Palm Springs for the fourth annual Bhakti Fest. From Sept. 6 through 9, about 3,000 people will descend on the high desert above Palm Springs for the fourth annual Bhakti Fest. 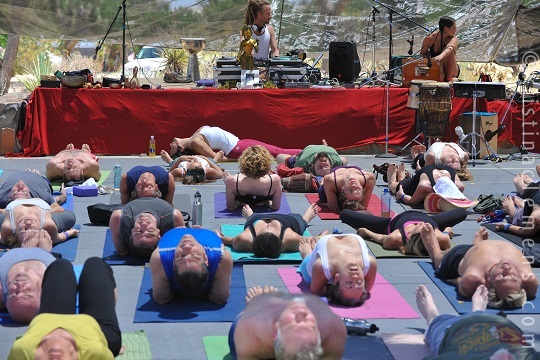 Billed as "The Festival of Yoga, Kirtan and Wisdom From the Heart," the event has been compared to Woodstock, which would make its location, the Joshua Tree Desert Retreat Center, Yasgur's Farm. The Woodstock analogy has its limits: Compared to the colossal New York Thruway standstill in 1969, the traffic will be smooth sailing, the accommodations will be decidedly less funky, ATMs and healthy food will be readily available, this being the desert, there will be no mud, and no one will have to make an announcement to avoid the brown acid. But the comparison is valid in that music -- albeit a different kind of music -- will be played nonstop, the crowd will consist mainly of young celebrants, and the festival carries cultural and spiritual significance. First, some Sanskrit-to-English translations. Bhakti means, essentially, devotion, and bhakti yoga is one of the principal spiritual pathways described in the Bhagavad Gita and other classic texts. Often called "the path of the heart," bhakti can take on many expressions, such as selfless service to a guru, deity worship, or devotional chanting, typically in the form of call-and-response repetition of Sanskrit mantras that invoke various names of the divine (Krishna, Shiva, Lakshmi, Kali, et al). That would be kirtan, and at Bhakti Fest it will be performed by live musicians -- with the enthusiastic and often ecstatic participation of devotees -- literally 24/7. It won't be all kirtan all the time though. There will be yoga classes 12 hours a day, led by some of the leading teachers in the land, "wisdom workshops geared to educate and inspire" (my topic is "The Beatles' Yoga"), and an "eco-friendly vendor village of more than 100 artisan merchants," so the multitudes will not lack for veggie nutrition, healthy beverages (it's the desert, folks) and yogic accessories. But the centerpiece is kirtan, and it will be led by some of the stars of the burgeoning art form who have, collectively, created an intoxicating East-West curry by blending traditional Indian chants and musical motifs with rhythms, instruments and flourishes drawn from rock and jazz. Having chronicled the history of Indian spirituality in America (American Veda), I find the kirtan explosion to be as fascinating as the music is electrifying. The tradition that evolved from India's Vedic era into what we broadly think of as Hinduism is far more diverse than most Westerners realize. The gurus who came here emphasized certain aspects of the teachings and downplayed others that might have been incomprehensible or unpalatable to Americans at the time. Hence, what Westerners first embraced were the philosophy of Vedanta and the meditative methods of Yoga. In time, the physical practices of Hatha Yoga took center stage, and now the postures, stretches and bends called asanas have come to virtually define Yoga in the U.S. The bhakti tradition of chanting was kept pretty much under wraps by most gurus, who made it available mainly to their close students. The exception was the founder of the Hare Krishna movement , A.C. Bhaktivedanta Swami, whose devotees were chanting in city streets and parks back in the late 1960s. Today, what seemed bizarre 40 years ago is going mainstream so quickly that there is talk of a kirtan Grammy category. Bhakti Fest and the frequent kirtan evenings at yoga studios throughout the country are proof of how assimilated Eastern spirituality has become. Artists who were lucky to draw 10 people to chant with them 20 years ago now sell out concert halls, and their CDs do brisk business. Whether you're a spiritual devotee or just a fan of world music, if you come upon the right kirtan performance or recording, you might find it as elevating as the devotional compositions of Bach. And if you're feeling adventurous, come on down to Bhakti Fest. Sridhar Silberfein, the founder and producer -- and a living link to Woodstock, having arranged for Swami Satchidananda to open the festivities with a calming discourse and a Sanskrit chant -- says that "Bhakti is devotion to love" and "this year's Bhakti Fest will be a total immersion in this love for all the presenters and attendees." If that appeals to you, bring plenty of water, sun block, a cushion to sit on, maybe a shawl for the cool, dry evenings and, if you intend to get any sleep within earshot of the speakers, a good pair of earplugs. For more by Philip Goldberg, click here.